Ice Cream Sandwich Incoming: Devs Get Their Apps Ready! Google have just gotten around to telling developers to prepare themselves for the release of Ice Cream sandwich. A blog post on the official android blog confirms that ICS "will support big screens, small screens, and everything in between". The future of android is coming, and it doesn't matter what size screen you have! Google go on to tell developers that all Honeycomb apps will run on ICS, and because some developers may have designed their app specifically for the large screen, ICS will break their apps when ran on smaller screens. Google suggests that developers use one apk for all screen sizes, and develop their app to make use of fragments (or sections/individual screens you could say). For larger tablets selecting an activity within the app will show the current screen, as well as the new screen at the same time, a multi-pane layout of the two fragments. 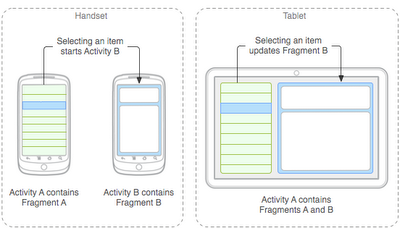 For smaller screens, only one fragment will be shown at a time, a single-pane. The most effective way to optimize your app for both handsets and tablets is to combine fragments in different ways to create â€œsingle-paneâ€ layouts for handsets and â€œmulti-paneâ€ layouts for tablets.